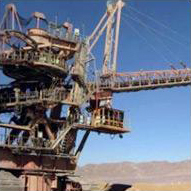 Stacker/Reclaimer at ports is a typical line where UAR high abrasion resistance is required. Bridgestone High Abrasion Resistant compound – UAR – is Bridgestone original compound specially developed for transportation of small but highly abrasive materials. Its name “UAR” is the abbreviated name of “Ultra Abrasion Resistant” compound. Since the first introduction to market, UAR has been recognized as an optimum compound for high abrasive operation among various mining and port markets in the world. SXEW compound is customized model of UAR compound to suit specially the SXEW process at copper processing plants where conveyor belts wear out rapidly. SXEW process at copper processing plant. Customized SXEW is specially studied and designed for SXEW process. Bridgestone UAR abrasion resistance is substantially higher than global standard abrasion resistant rubber "DIN-W". DIN Abrasion Testing Method is global standard methodology for testing abrasion resistance of rubber samples. A rubber sample is exposed to abrasion by being pressed to rotating sand paper for a specific period of time. Lower volume loss of the rubber sample indicates higher abrasion resistance.